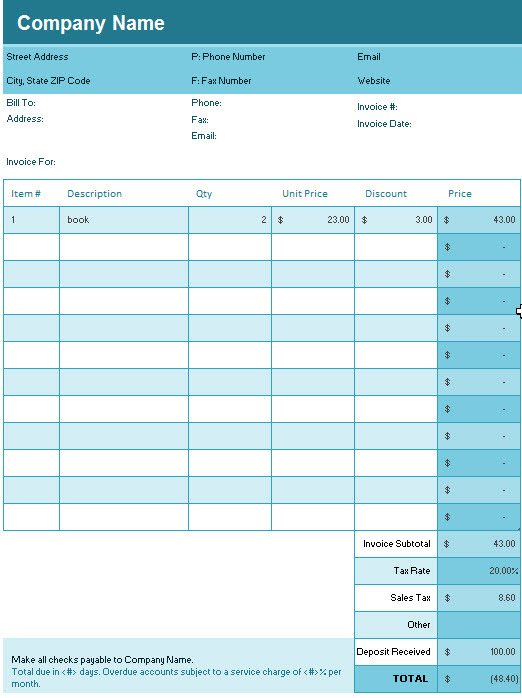 This invoice template for excel will calculate line item totals, sales tax, Deposit Received and deduct discount offered. And it is very easy to customize and use. And you can download it freely to use it in your business. Invoice Subtotal: This excel invoice template will calculate the subtotal amount automatically in Cell G21, and it call one SUM function (=SUM(SimpleInvoice[Price])) in this excel cell. Sales Tax: If you do not want to calculate the Sales Tax, just leave “TaxRate” as blank. Or it will convert the value to percentage format. Deposit Received: if your customer pays the deposit, then you need to add value in Deposit Received. You can click the below download button to get this simple invoice template for free.